1 Put the tomatoes with their juices in a large, shallow baking dish (about 35 x 22 cm) (approximately 13 x 9 inches) and mash slightly with a fork. Season with salt and pepper. 2 Peel the onion and garlic, chop finely and add to the tomatoes. 3 Crush almonds and olives in a mini processor to form a paste. Add the mustard and process until creamy, thinning with a little water if needed. 4 Rinse chicken breasts and pat dry, then season both sides with salt and pepper. Arrange in baking sheet and top with olive mixture, dividing evenly. 5 Peel potatoes and cut into about 3 cm (approximately 1-inch) cubes. Place in a bowl. 6 Rinse lemon in hot water, wipe dry and finely grate the zest. Cut lemon in half and squeeze out juice. Mix lemon zest and juice with olive oil and the potatoes. Season with salt and pepper. 7 Line a baking sheet with parchment paper. Put the baking dish in the middle, distribute potatoes together with liquid around the dish and bake everything on the middle rack of a preheated oven at 225°C (fan 200°C, gas: mark 3-4) (approximately 425°F) for about 20 minutes. Remove chicken and cut into slices. 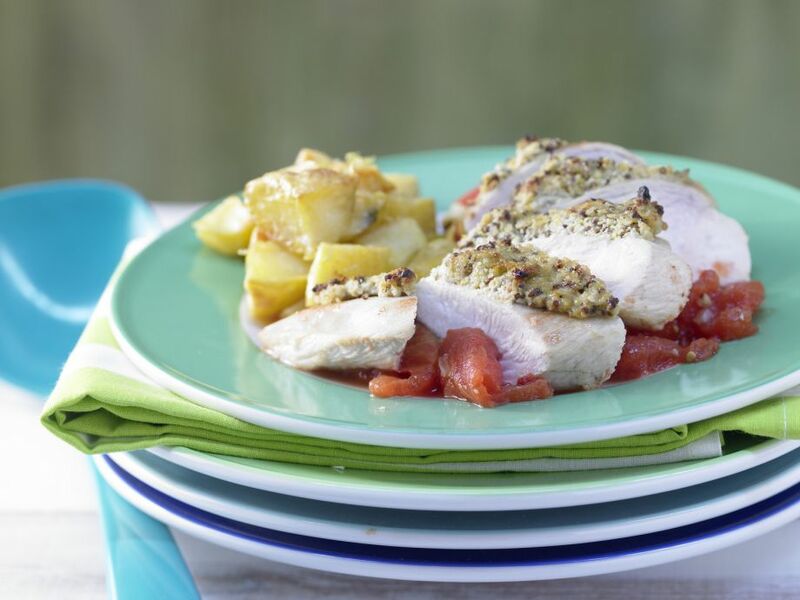 Divide tomato sauce and chicken among plates and serve with potatoes.